Today I just purchased an SD Card HxC Floppy Emulator off Ebay for testing with the Roland W-30 and Roland S-330 Samplers that I have. I’ve been pondering whether to to do this or not and finally gathered enough info with my own research on the subject. I feel it’s worth giving it a shot to see if the SD Card HxC Floppy Emulator rev. C works with my Roland W-30 or S-330. 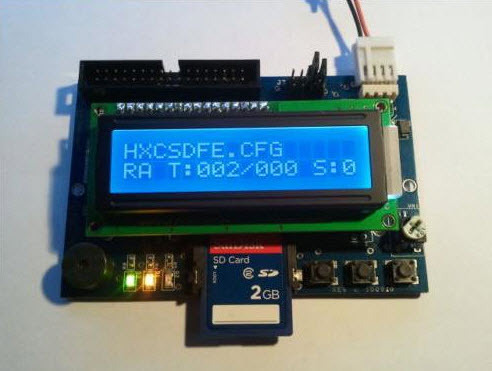 The SDCard HxC Floppy Emulator can replace different kind of floppy disk drive and allows you use SDCard media instead of floppy disk. I heard this Emulator will work with the Roland S-50. The Roland W-30 and S-330 are very similar if not the same as the Roland S-50. I really need something more reliable for my samplers and so I thought why not give it a test. I also have a couple of other synths that likely could work with the SD Card HxC Floppy Emulator, so all is not lost if it fails to work on the Roland W-30 and S-330. We’ll see! It’ll be a couple of weeks before I receive the SD Card HxC Floppy Emulator in the mail. Please stay tuned for further updates on how I progress with this project. Thanks! Does the SD Card HxC Floppy Emulator work on the Roland S-330 and W-30 Samplers? There is a new release of SMFW30 is coming soon! It’s a Sound Manager for the Roland W-30, S-330, S50, and S-550 Vintage Samplers. Over on the SMFW30 Forums, Miro has released some beta info about the new Roland W-30 Software Sample Editor. I think registration is closed there due to spam issues, but you should at least be able to view the updates. I’m on there so if anyone has any questions, I can pass them along to Miro for you if I don’t know the answer. Above is a screenshot which looks great. This is definitely a welcome upgrade and should hopefully add some new life to the aging but popular Roland W-30. Hare are some details taken from the forum posting. I am really looking forward to this release. Currently I prefer transferring my WAV files to the Roland W-30 via the S-330 and other software connected to it via the computer. However, if I can do everything I need with SWMF30, then that would clearly be the way to go. Stay tuned for more news and about about the SMFW30 software upgrade for the Roland W-30. Today I managed to locate a used Roland S-760 Digital Sampler at a remote used music shop near Nagano City here in Japan. The unit was in excellent condition and it had the manuals, but no disks. The gentleman at the counter said it was junk and I said to myself “Are you kidding?”. He sold it to me for $35 because he said he couldn’t get it to work without the disks. I wanted to say if he had heard of the internet at all, but instead I slapped down the cash and walked away with a fine Roland S-760. At home I found some english manuals in PDF format from Roland and then later found the System OS 2.24 disk needed to fire it up. Sure enough, the Roland S-760 started up beautifully and I was all ready to go. I even noticed I had the OP-760-1 board in the back and the memory fully expanded at 32MB. Amazing!! I still don’t have a Roland MU-1 Mouse yet, but I did manage to install SoundDiver 3.0.5.2 for Windows which has the Roland S-760 and S-330. I connected the Roland S-760 to SoundDiver and everything worked great! A friend of mine had several Rhodes samples which I loaded into the Roland S-760 and they sounded fantastic! I then connected an MO Disk Drive to the SCSI on the back and saved the samples to an MO disk. I also saved the system, but I am not sure if you can boot off an MO or other drive with the Roland S-760 yet. I know you can with the Roland W-30. The MO drive was very quiet and fast when both saving and loading files I thought. So after I boot up the S-760 using the Floppy, I can then load up all the different Rhodes Performances rather quickly. It’s been a fun couple of weeks. I never thought I could score a Roland W-30, S-330, and S-760 all for $200 in near mint condition. Indeed I have to work with SCSI and older gear, but the sound quality is really really good. I also find it a lot of fun playing around with older gear as well as someone who grew up in the 80’s and 90’s. It’s just amazing at how little people will take for this stuff here in Japan. If you check out the rest of my blog, you’ll notice all of the great deals I’ve been finding lately. Check out Synth Japan forums for more discussions. Please check out the comments below for updates on this post. Roland S-330 Score! Last week I noticed a used Roland S-330 at my local second hand music shop in Nagano city. At the time I decided not to buy it because they were selling it for $125 and I thought that might be too much. I was surprised today to go back and see that the price had been knocked down to $35, so I decided to grab it and run to the counter!! LOL. After getting it home and plugging it in, I found everything about it was in excellent and almost new condition. I wasn’t able to get a Roland MSX MU-1 Mouse or an RC-100, but thats ok. I figured I could use the Roland S-330 as a sort of memory “upgrade” for the Roland W-30 which means I would use them together. You can’t use W-30 sample disks directly for the S-330, but you can convert or use Roland S-50 and S-550 disks. Using the SMFW30 and SDISKW software I can create just about any disk I want. Plus I can import WAVs with ease. 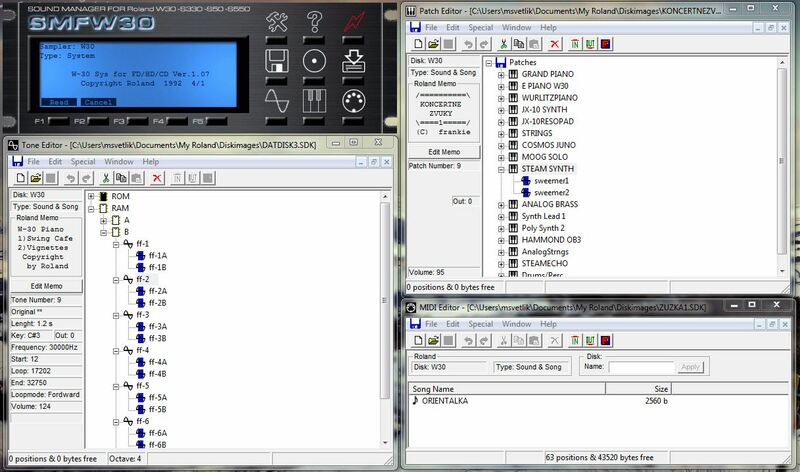 In addition, I have MIDI Quest XL with the Roland S-330 instrument file and so far it works great with connecting to the Roland S-330. From the back of the Roland S-330 I have a connection to my Toshiba Flatscreen Digital TV and via B&W it works great for a monitor. Using MIDI Quest though I may not need it. I also don’t need the mouse as I can either use the Roland S-330 editor or the front panel buttons. All of the System and Utility Disks work great. I also have a Roland SYS-333 S-330 Director-S disk, but no hardware dongle. I am currently looking for a working version of the Roland S-330 Director-S software which I’ve heard exists. At least I know it does for the Roland S-550. The Roland W-30 workstation teamed up with the Roland S-330 is a pretty good combo thus far. Both have the same sound engine which is why I think they go well together. I have editors and am able to import Wav files without any issues, so I think it should be pretty fun jamming with these two machines for the rest of the summer. Update: I ran across this great youtube video about how to use the Roland S-330 has an actual programmable synthesizer or close to it. This is really cool! The video shows how Roland S-330 can be used without samples, as a stand-alone basic virtual synthesizer. First I load the OS, then I sample 400ms of silence, then I use the ‘wave draw’ function to draw my waveform and loop only what’s showed in the wave window (that is, most of the sampled data won’t be used). The TVF (Time Variant Filter) is the most interesting part. It also offers an 8-stage envelope. With the patch parameter you can set the unison mode and use the detune for a fatter sound. What you see here is what is output from its video socket, and what you hear is what is output from out #1. I plan to give this a try once I find a way to externally control the Roland S-330. I’m currently trying to locate a mouse.